Birds enthrall us with their stunning plumage, amusing antics, and lilting song. Avian art inspires in endlessly novel ways too, evoking the freedom of flight and the fragility of their earthbound existence. 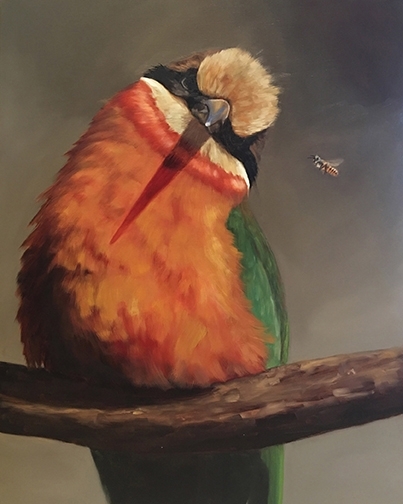 Artists from throughout the world push themselves to new heights, striving to be selected for the internationally renowned “Birds in Art” exhibition. The 43rd annual “Birds in Art” exhibition celebrates avian marvels through new interpretations — in an array of mediums, including oil, watercolor, the graphic arts, bronze, stone, and others — created within the last three years. Saturday morning opening festivities for “Birds in Art 2018” will include honoring New England pastel artist Cindy House (art featured at top) as the 2018 Master Artist. House’s exquisite pastel landscapes appear — by design — to be oil paintings, and feature sweeping vistas of avian habitats. House began as a bird-book illustrator working in watercolor, a career she credits “Birds in Art” with helping to launch. Editors, seeking an artist to work on illustrations for a new National Geographic Field Guide to the Birds of North America, attended the “Birds in Art” opening in 1981, House’s first year in the exhibition. “Impressed by my work, they called me a week later,” House said. “From then on, to be accepted into ‘Birds in Art’ was an annual goal for me.” Since then, she has attained that goal 26 times and attended the opening 23 of those years. The exhibition also played a part in her search for a new medium. The artist reflected, “I eventually found my life’s passion in pastels, and it was at ‘Birds in Art’ where they first found an audience.” Fifteen Cindy House artworks will comprise her 2018 “Birds in Art” Master Artist grouping. “Regal Bearing: Bird Portraiture” is on view September 4, 2018, through August 11, 2019, at Leigh Yawkey Woodson Art Museum (Wausau, Wisconsin). For more information, please visit www.lywam.org.